Owners Pieter and Marli de Koker are proud to givr you excellent service and true South African hospitality. Each guest room has a private entrance as well as security gate controls. There is a private dining room where breakfast is served, as well as a private lounge where one can relax and enjoy the fireplace, honesty bar, book and magazine collection and some games. 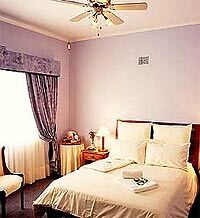 The guest house consists of 6 stylishly decorated rooms. One has a double bed and the other 5 are twin bedrooms. All rooms are en-suite with TV, fan, clock radio, hairdryer, telephone, writing desk, free internet connection, heater and a bar fridge. But it’s the extras that will make your stay even more memorable, like the complimentary soaps and shampoo’s as well as the sherry, chocolates, coffee/tea making facilities and rusks. There is a lovely lapa with an enclosed Jacuzzi to relax weary bodies, together with braai and bar facilities. There is sufficient parking behind electric gates.